In November Carolyn Eccles, Natalie Rogers and I were Artists In Residence at Q Theatre. During the residency we developed a performance art/theatre piece. The residency was organised by the wonderful StageJuice who ran Freshly Squeezed. Caz, Nat and I came together through Freshly Squeezed and performed as ‘The Cabana Bay Club Dancers’. I don’t have much that I can leak about the development at present but I can share a photo! Intriguing no? I’m really excited that I’ve been invited to participate in Freshly Squeezed 2012. 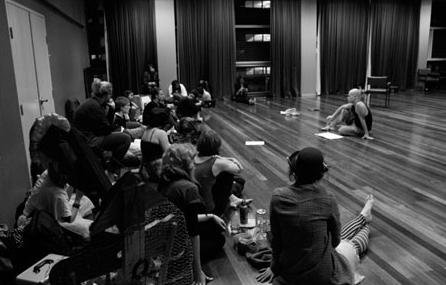 Freshly Squeezed is a workshop run by StageJuice that brings together ‘Sydney’s most exciting’ (their words 😛 ) emerging artists in theatre, dance, sound art, music, visual arts, media, film and installation, to work together with mentors. The idea is for the workshops to be a way for new works to develop. The mentoring and workshopping culminates in an evening of short experimental works, a presentation of fresh ideas and new collaborations. The presentation will be showing at PACT theatre with performances on Friday the 19th of October (7pm) and Saturday the 20th of October (2pm and 7pm) . I hope you guys can come! You can track our progress on the Freshly Squeezed Blog here.